As part of their commitment to the community, Five Guys Burgers and Fries is partnering with the Relay for Life of Tamarac – North Lauderdale and the American Cancer Society (ACS) to help raise funds and generate awareness for cancer research. 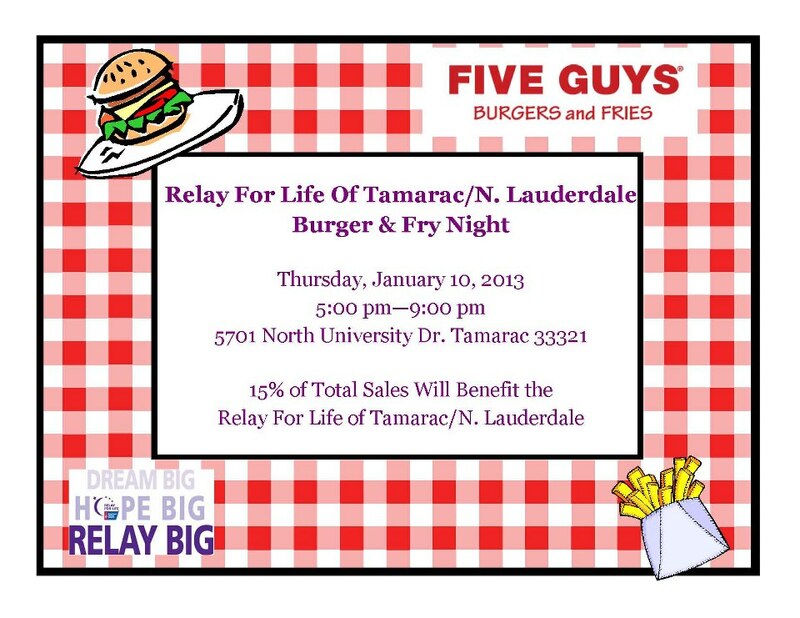 To help with the effort, Five Guys Burgers and Fries – located at 5701 North University Drive, Tamarac, FL 33321 – is hosting a special event Thursday night, January 10th, during which 15% of its total sales from 5-9 p.m. will be donated to the Relay for Life of Tamarac – North Lauderdale. Beginning at 5 p.m. and throughout the evening, guests are welcome to dine at Five Guys Burgers and Fries to support a great cause. Information about the Tamarac – North Lauderdale Relay for Life, the American Cancer Society and the important work of its foundations and community outreach will be available. The Relay for Life of Tamarac – North Lauderdale will be held on May 17th and 18th at Millennium Middle School in Tamarac. For information on the event, you may visit them online, “Like” them on Facebook or follow them on Twitter. Local law enforcement authorities have begun arresting unsuspecting South Floridians. Having a bad dream? No you are not “under arrest.” The rights you have just heard are all in fun and part of David Singer’s annual Jail and Bail event to benefit the Broward County chapter of the American Cancer Society. “Some of South Florida’s most high-profile figures will appear in front of a judge this week and answer charges ranging from ‘illicit basket-weaving’ to ‘needle dusting,’ stated attorney Marc Anidjar of Anidjar & Levine PA, an event sponsor. Required to “post bail” to secure their release, it’s all to benefit the American Cancer Society and cancer research. This year’s Jail and Bail honorary chairman is Jason Taylor – former Miami Dolphins linebacker, ESPN NFL analyst, and co-founder of the Jason Taylor Foundation. Following in the footsteps of legendary criminal defense attorney Roy Black, NSU Chancellor Ray Ferrero, Broward Sheriff Al Lamberti, State Attorney Michael Satz, radio personality Paul Castronovo, U.S. Rep. Debbie Wasserman Schultz, former Florida Marlins coach Jack McKeon, WPLG newscaster Kristi Krueger, former Miami Dolphin Bernie Kosar and WQAM personality Joe Rose, Taylor continues the tradition of influential leaders that have lent their name and support in the effort to fight cancer. Having committed himself to the American Cancer Society, Singer has chaired Jail & Bail for over 20 years. Donors pitch in to “bail out” their family and friends during a 90 minute “detention.” Dozens of local business and community leaders take part in this yearly ritual. 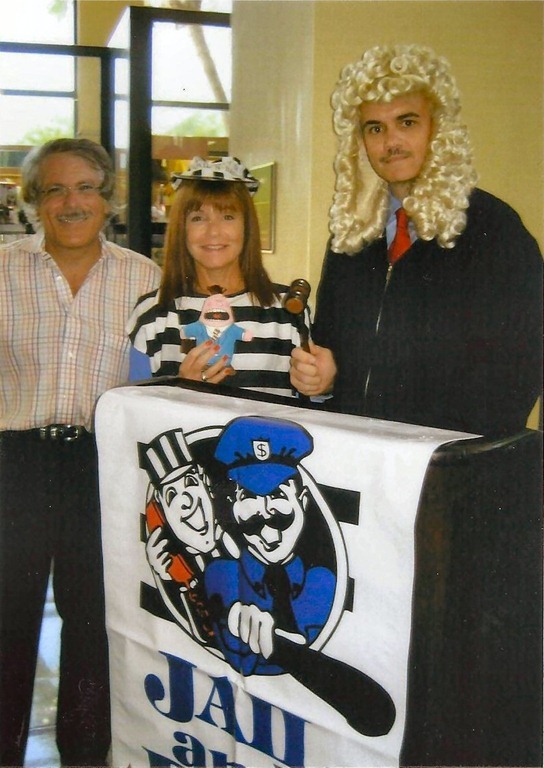 Since the start, Jail and Bail has raised over $2.4 million for the Broward unit of the American Cancer Society. For 2012, Singer has targeted a goal of $200,000. For more information on the 21st Annual Broward County Jail and Bail to benefit the American Cancer Society, please call David Singer at (954) 920-1571. No you are not “under arrest.” The rights you have just heard are all in fun and part of David Singer’s annual Jail and Bail event to benefit the Broward County chapter of the American Cancer Society. Some of South Florida’s most high-profile figures will appear in front of a judge later this month and answer charges ranging from “illicit basket-weaving” to “needle dusting.” Required to “post bail” to secure their release, it is all to benefit the American Cancer Society and cancer research. 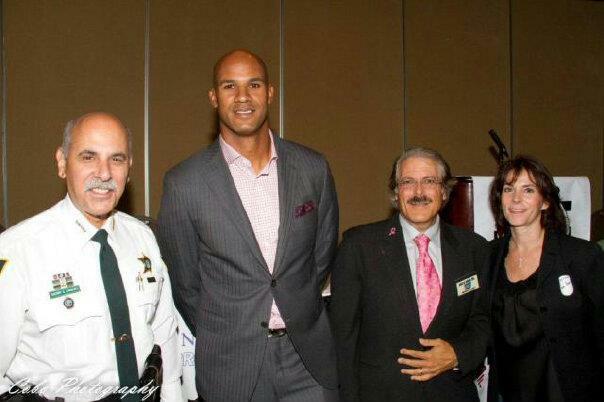 This year’s Jail and Bail honorary chairman is former Miami Dolphins linebacker and ESPN NFL analyst Jason Taylor. Having committed himself to the American Cancer Society, Singer has chaired Jail & Bail for more than 20 years. Interesting guests and timely topics will be on the air this week on AM 1470 WWNN and The Credit Report with Bill Lewis. Fort Lauderdale personal injury attorney David Singer will appear and discuss Tuesday’s “Up-the-River” Cruise on behalf of Jail and Bail as well as the Broward unit of the American Cancer Society. Florida’s 34th Senator and current U.S. Senate candidate George LeMieux will appear and discuss his candidacy in the Republican race to replace Democratic Senator Bill Nelson. Foreclosure defense attorney Carlos Reyes will discuss the latest developments and controversies surrounding the foreclosure crisis in Florida. Davie Mayoral candidate Mike Crowley will appear and discuss his candidacy for mayor and his plan to create jobs by attracting high-technology business to Davie. Fort Lauderdale criminal defense attorney John Contini will discuss the importance of the sealing or expungement of criminal history records when seeking employment in a tough economy. Broward Sheriff Al Lamberti will appear and discuss Hurricane Preparedness and other initiatives of the largest fully accredited law enforcement agency in America. Immediately following the Steve Kane Show on AM 1470 WWNN, The Credit Report with Bill Lewis is a daily forum for business and financial news, politics, economic trends, and cutting edge issues. Bill can be heard weekday’s at 9 o’clock on AM 1470 WWNN in south Florida or by streaming audio at www.wwnnradio.com. Phone lines are open at (888) 565-1470. The 10th Annual “Up the River Cruise” is the final fundraiser of “Jail and Bail” and is one of the largest for the Broward unit of the American Cancer Society. Setting sail from the Doubletree Hotel in Fort Lauderdale at 6:15 p.m. on Tuesday, August 30th, tickets are still available. Following in the footsteps of NSU Chancellor Ray Ferrero, Broward Sheriff Al Lamberti, and State Attorney Michael Satz, Roy Black continues the tradition of influential leaders that have lent their name and support in an effort to fight cancer. Serving as Master of Ceremonies on the cruise, Black is senior partner of Black, Srebnick, Kornspan & Stumpf, P.A., and is one of the nation’s premier trial lawyers. The three-hour “Up the River Cruise” on a gorgeous Sun Dream Yacht features great food, an open bar and a guest list of Broward’s most influential people. All inclusive at $135.00 per person, your charity donation to the American Cancer Society is used for research, patient services, advocacy and education. A cancer survivor himself, Sheriff Al Lamberti supports the research and treatment initiatives funded through the Cancer Society. “As not only a cancer survivor, but a cancer conquer, I’m proud of what David Singer has done for cancer research and the American Cancer Society,” said Lamberti. Having raised over $2 million the last two decades, this year’s Jail and Bail has raised more than $145,000 for the Broward unit of the American Cancer Society. For more information on the 10th Annual “Up the River Cruise” to benefit the American Cancer Society, or to purchase tickets, please call Jo Walters at (954) 920-1571. Some of South Florida’s most high-profile figures will appear in front of a judge this week and answer charges ranging from “illicit basket-weaving” to “needle dusting.” Required to “post bail” to secure their release, it is all to benefit cancer research. Roy Black, the senior partner of Black, Srebnick, Kornspan & Stumpf, P.A., is one of the nation’s premier trial lawyers and chairman of the 19th Annual Jail and Bail Event. Following in the footsteps of NSU Chancellor Ray Ferrero, Broward Sheriff Al Lamberti, and State Attorney Michael Satz, Black continues the tradition of influential leaders that have lent their name and support in the effort to fight cancer. “Arrested at their home or place of business, jailbirds will be housed in cells pending an appearance in front of our judge,” said Hollywood personal injury attorney David Singer, chairman of the four-day event, which runs through Friday. Detainees call family and friends in an effort to raise money for their release and in support of the American Cancer Society. Donors pitch in to “bail out” their family and friends during a 90 minute “detention. Dozens of local business and community leaders take part in this yearly ritual. Given the real-life scandals engulfing Broward’s politicians and the powerful elite – along with recent news reports of more arrests and charges in the Scott Rothstein case – the event seems a bit surreal. “It’s hitting a little too close to home for some,” said Singer. The Jail and Bail event started Monday evening in the lobby of the Airport Sheraton, 1825 Griffin Road, Dania Beach, with current and former mayors constructing a jail to detain those “arrested.” The four-day event concludes Friday and is followed later by an “Up the River Cruise” on August 30th. For more information on the 19th Annual Broward County Jail and Bail to benefit the American Cancer Society, please call (954) 920-1571.